What's The Deal With The Deepening Dispute Between U.S. And Turkey? With the tariffs, sanctions and insults, these longtime allies are looking like anything but. As the Turkish lira falls, you may wonder what's going on here — and why it matters. We have answers. President Trump speaks with Turkish President Recep Tayyip Erdogan during a tour of the new NATO headquarters last month in Brussels, Belgium. Despite their alliance, the U.S. and Turkey have experienced escalating friction in recent weeks. Turkey's currency is in a bad way. That much is evident from the past week, which has seen the lira tumble in value at a breakneck pace. It has dropped more than 40 percent against the U.S. dollar on the year, with much of that plunge unfolding since the start of August. Before a modest rally early Monday, a single dollar bought about 7.2 lira — a grim new record for Turkey. Amid this time of tumult, when one might expect a country to lean on its longtime friends, Turkey instead has found itself embroiled in an escalating diplomatic duel with an ally of some 66 years: the U.S. Earlier this month the longtime NATO members engaged in a heated exchange of sanctions and threats of retaliation. Not long after that, President Trump said his administration would be doubling its tariffs on Turkish steel and aluminum — raising the levies to 50 percent and 20 percent, respectively, and helping encourage the lira's free fall Friday. Turkish President Recep Tayyip Erdogan fired back Monday, accusing the U.S. of stabbing its ally in the back. "Is this acceptable?" he asked in Ankara. Trump was simply stating the obvious in his tweet announcing the tariffs: "Our relations with Turkey are not good at this time!" What is not obvious, however, is how things got to be so bad between these perennial allies — and why, exactly, it matters so much, both to them and the world at large, that their alliance is stumbling now. So here's an explanation. How big is the risk for Turkey's economy and the global economy? Why is the U.S.-Turkey relationship such a big deal? 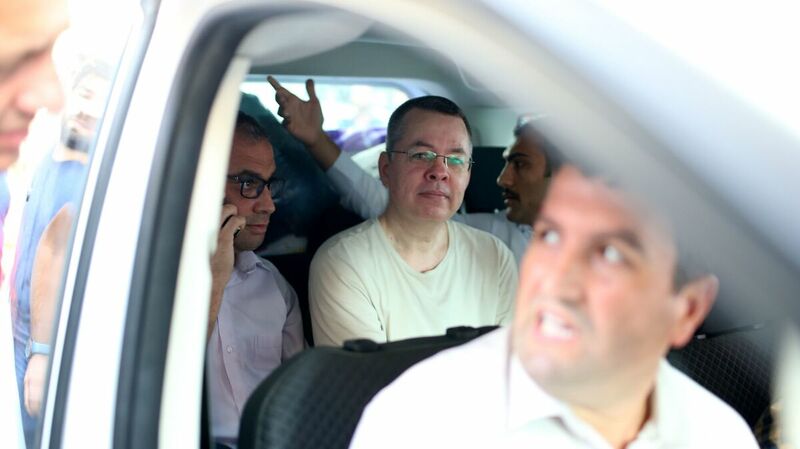 Andrew Craig Brunson, a U.S. pastor on trial for espionage in Turkey, sits in the backseat of a vehicle squeezed between two Turkish plainclothes police officers late last month. The minister's nearly two-year detention has become a flashpoint of friction between the two allies. 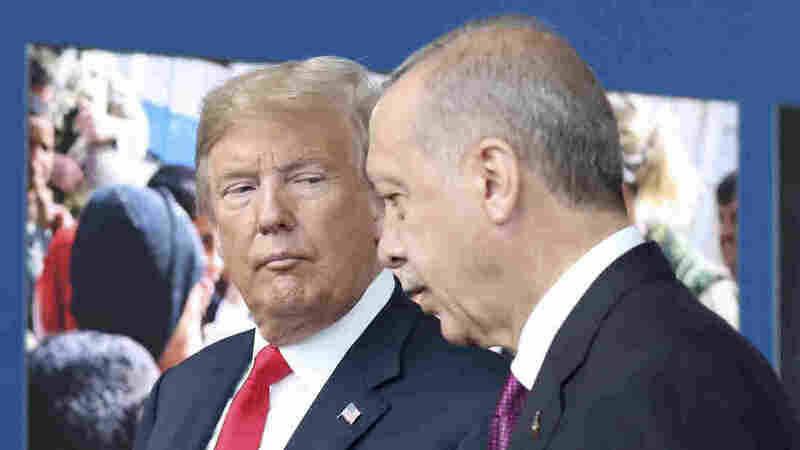 There has been friction between the U.S. and Turkey dating back at least to the Iraq War, when the two countries sparred over the extent of Turkish involvement. Those tensions have flared anew in the midst of the violence roiling Turkey's neighbor Syria. In the fight to dislodge the Islamic State from the country, the U.S. elected to arm and support Kurdish fighters, known as the YPG, against the Islamist militant group. That move rankled Turkey, which views those fighters as terrorists connected with another organization known as the PKK, a Kurdish separatist group working within Turkish borders. Though the U.S. and the European Union, like Turkey, classify the PKK as a terrorist group, they do not share Turkey's view in designating the YPG as terrorists. But the roots of the most recent, and apparently most bitter, dispute rest with two men of faith: a U.S. minister and a Turkish cleric. Andrew Brunson, an evangelical Presbyterian minister from North Carolina who has spent more than two decades in Turkey, got caught up in the massive crackdown that followed a failed coup attempt against Erdogan in summer 2016. In October of that year, just a few months after the Turkish president reasserted control, Brunson was detained on suspicion of associating with the failed coup. Now he faces charges of espionage and aiding terrorists groups, and Washington is deeply upset about it. Just days after Vice President Pence called for his immediate release, the U.S. Treasury Department listed Brunson's "unjust detention and continued persecution" as the principal reason for its sanctions against two Turkish officials. Ankara has been unwilling to cough up the detained U.S. minister — partly because Turkey has repeatedly tried, and failed, to obtain the extradition of a Turkish preacher from the U.S. Fethullah Gulen, a septuagenarian Islamic cleric and scholar with whom Erdogan has long feuded, recently accusing Gulen of being the mastermind behind the plot to oust Erdogan. The trouble for Erdogan is that Gulen has lived in Pennsylvania since the late 1990s, and the U.S. has steadfastly rejected efforts to bring him back to Turkey to face trial. The Turkish president has at times linked the two men's fates, once even making his preferred arrangement quite clear: "You have a pastor too," he said last year. "You give us that one and we'll work with our judiciary and give back yours." But now, with neither side willing to budge, both allies have arrived at an impasse, which diplomatic and economic pressure has done nothing to dislodge. "We support diplomacy and negotiations but it is not possible for us to accept impositions," Turkish Foreign Minister Mevlut Cavusolgu told a gathering of the country's ambassadors Monday, according to The Associated Press. A woman sorts some Turkish Lira in Istanbul on Monday.The lira hit another record low overnight, stoking fears from foreign investors over the country's financial crisis. Turkey's overall economy is not — at least for now — in a free fall or outright crash. In fact, it's growing by 3 to 4 percent a year, and the country's unemployment rate is hovering around its usual levels. But in the midst of a building boom, the Turkish government borrowed a lot of funds for construction. Now, it owes a lot of money, and its lenders are worried. In part, they're concerned about Erdogan's unorthodox insistence that the Turkish Central Bank not raise interest rates. Raising interest rates is the usual response to remedy a currency's weakening value — but he ran on a vow that he would not do so, and it's a vow he is maintaining even as the lira badly falters. That's not just a Turkish problem. 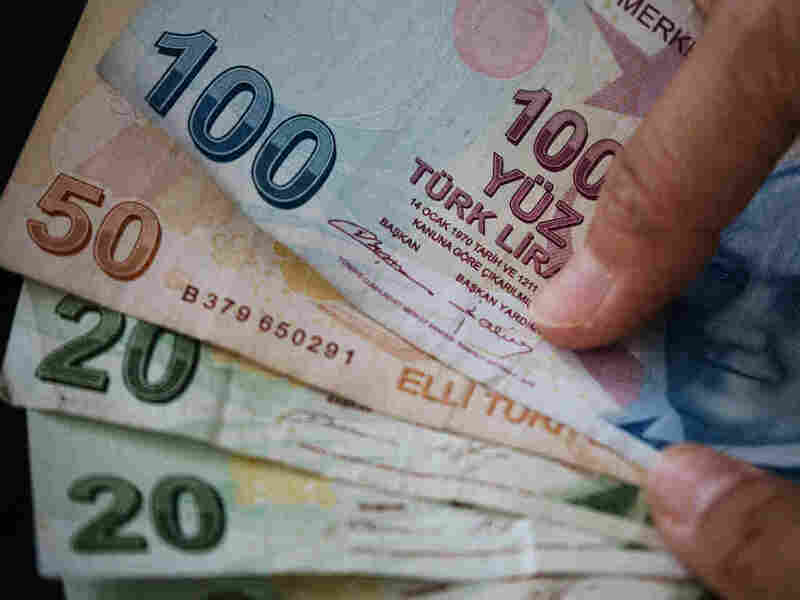 As confidence in Erdogan and the Turkish currency drops, European banks that lent money in Turkey are beginning to worry about whether they can recover their loans. And analysts say this currency problem, coupled with rising interest rates in the U.S., are scaring investors off other emerging economies. "Many of these countries have borrowed a fair bit in international markets and especially have done a lot of this borrowing in dollars when dollar borrowing was cheap. Now the chickens are coming home to roost when interest rates in the U.S. are rising," global economist Eswar Prasad told NPR's Audie Cornish. "So what's happening in Turkey is acting as a trigger for international investors to reevaluate," he added. "That leads to some money coming from the emerging markets and makes the vulnerable ones — like Indonesia, Argentina, South Africa — even more vulnerable ... and strengthens the dollar, which adds to the pressure on these emerging market economies." 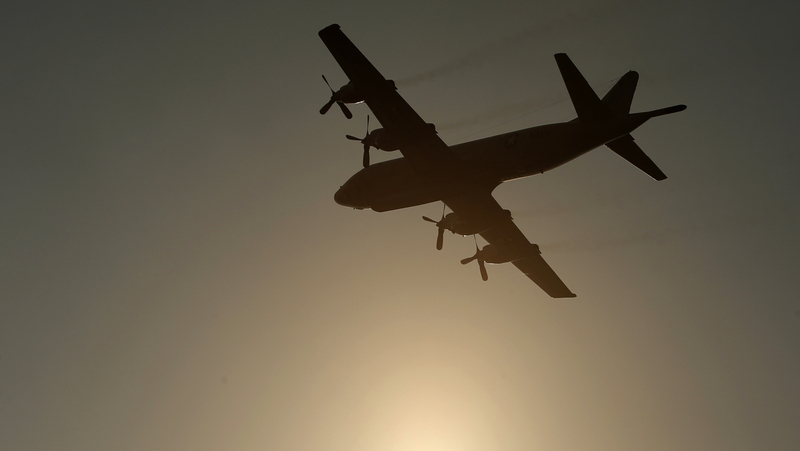 A U.S. Navy aircraft flies over Incirlik Air Base, on the outskirts of Adana, Turkey, in 2015. The U.S.-led coalition used the Turkish base as a key staging area for airstrikes against Islamic State targets, and U.S. troops continue to carry out missions from Incirlik. Turkey is not simply another NATO ally of the U.S. It has the second-largest military in the 29-member alliance, and it is a sturdy ally in a region of intense conflict and relevance to American interests. The country borders both Iraq and Syria, where the U.S. still stations thousands of its troops in the fight against ISIS. Those soldiers need air cover and supplies, both of which Turkish military bases are well-positioned to offer. It also borders Iran, where the U.S. has been seeking to apply diplomatic pressure — particularly since the start of the Trump administration. Earlier this year the U.S. backed out of the multilateral nuclear deal it had negotiated with Iran and five other countries, and last week it restored some of the sanctions that pact had lifted, vowing to bring back the rest in November. And Turkey is on the Black Sea, where Russian forces operate and, among other things, annexed Crimea from Ukraine in 2014 — against Ukraine's will. Beyond geographic considerations, Turkey has been a key partner in the fight against ISIS, a militant group that has staged attacks within its borders, and it is a rare Muslim nation that has diplomatic relations with Israel, another U.S. ally. Turkey has also been hosting more than 3.5 million Syrian refugees who might otherwise be traveling to Europe or the U.S.
And that's just in the present. The U.S.-Turkey relationship dates back decades, to their staunch partnership during the Cold War. The U.S. deployed nuclear missiles to Turkey to exert pressure on the Soviet Union — pressure so intense, in fact, that the promise to remove those missiles proved to be a key bargaining chip for the U.S. in ending the Cuban Missile Crisis. An F-35 jet stands on display in Forth Worth, Texas, in June. 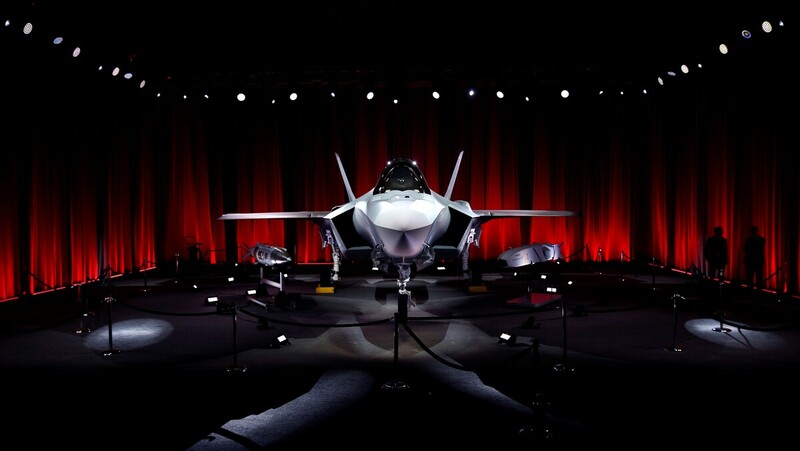 At the ceremony, held at a Lockheed Martin facility, Turkey took possession of a pair of the highly advanced fighter jets, which they will train with in Arizona for roughly a year. So, what can we expect going forward? That answer, as you can imagine, is tough to say for certain. But the diplomatic strife is beginning to show hints of some tangible effects on the nuts and bolts of their military agreements. Perhaps nowhere can that friction be better seen than in the tug-of-war over the F-35 Joint Strike Fighter, a state-of-the-art warplane produced by an nine-nation consortium including both countries. Turkey has ordered more than 100 of Lockheed Martin's stealth fighters. But Congress has pushed to block that delivery, citing the pastor Brunson's treatment in Turkey as well as broader national security concerns. "The Turkish government claims to have purchased a Russian air defense system designed to shoot these very planes down," Sen. Jeanne Shaheen, D-N.H., said last month during the bipartisan bid to press the issue. "NATO partners need these F-35s to counter Russian activity," she added. "We would be handing this technology over to the Kremlin if we granted Turkey these planes, and Congress will not stand for it." As NPR's David Welna reported in June, Turkey and Russia could use the air defense system Shaheen referred to — the Russian-made Triumf S-400 — "to run tests to reveal vulnerabilities in the F-35." Ulltimately, the Senate scaled back its effort, replacing it in the recent Pentagon budget bill with a requirement that Defense Secretary James Mattis file a report "on the status of the United States relationship" with Turkey before November. Turkey ended up taking possession of its first two F-35 aircraft earlier this year, but with a caveat: Turkish pilots must train with them at Luke Air Force Base in Arizona for at least the next year.